The 6 days Congo Classic Gorilla Safari is complete safari package that will offer you an opportunity to explore the two outstanding national parks of Democratic Republic of Congo. The 6 Days Gorilla Safari will take you through Africa’s most picturesque Virunga National Park –natural home of mountain gorillas situated in North-Eastern part of DR Congo. Thereafter, the safari connects you to stunning lowland gorillas trek in Khauzi Biega National Park located in South Kivu province, eastern Democratic Republic of Congo (DRC).The 6 days safari will entail activities like Mountain gorilla trekking, lowland gorilla trekking, Volcano hiking, Nature walks, cultural & community tours ,bird watching and so on. The safari will offer you life changing experience with taste of world-class services from some of the best lodges /hotels in DR Congo. Day 1 of the 6 Days Congo Classic Gorilla Safari-Kahuzi Biega & Virunga National Park: Arrive at Kigali International Airport & Transfer to Goma. Day 2 of the 6 Days Congo Classic Gorilla Safari-Kahuzi Biega & Virunga National Park: Early Morning Gorilla trekking in Virunga National Park. As soon as you arrive in Kigali international Airport, you will meet and greet our professional driver guide who then takes you to one of Kigali hotels for refreshment and mini briefing about the safari. Thereafter, you will embark on scenic transfer drive to Goma, DRC. The drive journey of 184kms about 3-4 hours without enroute stopovers is a breeze because of the excellent roads/transport in Rwanda to the border. When you cross the border, you will start feeling the excitement of Congo. On arrival to Goma town, you will advance to the lodge to check-in, have dinner and overnight. Following an early morning ebullient breakfast, you will transfer from your lodge to the park headquarters in Bukima sector for an early morning briefing about the dos’ and don’ts of gorilla trekking in Virunga National Park. After briefing, you will be led to the trail heads to enter the forest to search for the mountain gorillas in their serene environment of Virunga National Park. After 1-4 hours of trek depending on the movement of the mountain gorillas, you will come closer to the apes. Once up close to the mountain gorillas, you will be required to wear surgical masks that are provided to you when encountering the gorillas in their natural habitat of Virunga National Park. 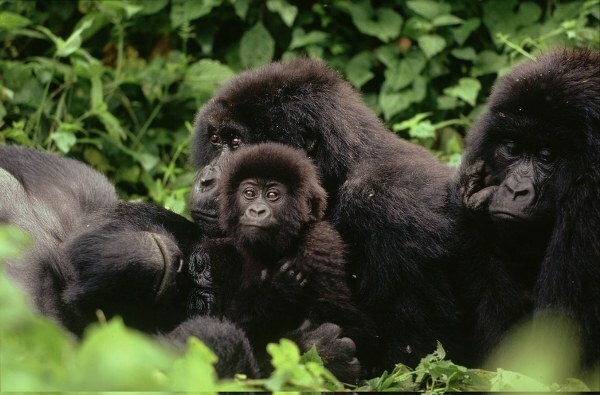 You will be allowed to spend one hour with the mountain gorillas and during this time you can decide to sit down watch gorillas carry on with their daily activities of feeding, caring for young ones. You will remain close to the beautiful apes while observing them, photographing and immediately after one hour, you will retire to the starting point and thereafter, embark on drive back to the lodge for lunch and relaxation. Following your early morning breakfast, you will embark on the transfer to the mountain trailhead at Kibat Patrol Post in Nyiragongo Volcano. Scenic drive to Nyiragongo towering above its own lava flows from previous eruptions is really very festinating. On arrival to the trail head, you will be briefed and thereafter, embark on the climb of about 5-6hours to the top of the Volcano. You will be accompanied by two armed rangers/guides who speak English and French. Your hike to the summit of the volcano does not only reward you with spectacular view of the flora and fauna gorgeous at lower elevations, but you also give a local person a job. When you get high enough, the views of over an old crater to Lake Kivu are stunning. Of course, those views are nothing compared to when you reach the crater and see the lava pool inside which is simply incredible. The night will be spent in tents on the rim of the giant crater, high above the active lava lake. Accommodation is in simple but comfortable A-frame huts on the crater edge. Warm clothes and a sleeping bag are essential as it will be very cold and windy all night. Right after taking cup of coffee, you will begin your descent very early in the morning from the summit of Nyiragongo to the head trail in Kibat Patrol Post. Arrive at the trail head transfer back to the lodge short refreshment and early lunch. After lunch you will embark on transfer drive from Goma to Bukavu in eastern DR Congo. The long drive will take your through green beautiful land scape dotted with farmed land, local population as well as rolling hills of DR Congo. On arrival to Bukavu, the driver guide will drive you direct to your pre-booked lodge for dinner and relaxation. Accommodation: Orchid safari Lodge. (Luxury/Mid-range), Hotel Horizon (Budget). After an early morning breakfast, embark on an early morning drive to the park headquarters for briefing about the rules and regulations to follow when trekking the lowland gorillas in Kahuzi Biega National park. After briefing, you will be led to enter the trekking trails to start searching for the gorillas. Trekking lowland Gorillas is very amazing, lowland Gorillas differ from the mountain gorillas, the lowland gorillas are bigger in size, usually takes 1-4 hours trekking the lowland Gorillas. 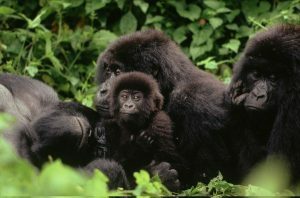 The lowland Gorillas stay in bigger families as compared to mountain gorillas; you will not regret the tour effort once you meet the amazing Gorillas. After one memorable hour of encounter with the lowland gorillas, you will retire back to the lodge for lunch and relaxation. After lunch, embark on an afternoon nature walk in the Kahuzi Biega Park .The nature walks will take you through Tshibati waterfalls, visit Bukavu town, Mbayo tea plantations, the research Centre and the surrounding traditional homes to explore the lifestyle of the local community. Thereafter, retreat back to the lodge for dinner and overnight. Accommodation: Orchid safari Lodge. (Luxury), Hotel Horizon (Budget). Right after an early morning breakfast, depart Bukavu driving back to Kigali. The scenic drive journey will take you through wonderful landscape in Bukavu in Congo crossing via Cyangugu boarder to Rwanda. You will have an en route stop in Butare, where you will visit the national museum of Rwanda, the king’s palace in Nyanza, and the Rwanda genocide memorial site. On arrival to Kigali, you will advance with the drive to Kigali International Air Port for your scheduled flight back home.